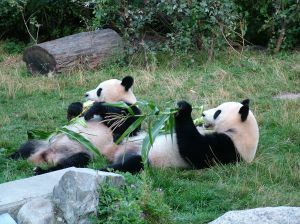 Wild Giant Pandas are found only in a number of relatively small areas within China. China has the largest human population of any country in the world, and the expansion of areas used by humans can inevitably mean that less space is available for Pandas. The lifecycle of the Pandas' principal source of food, the bamboo plant, means that Pandas need to be able to move from area to area over time. This means that a much larger territory is required to support a wild Giant Panda than many other animals. The breeding season for Pandas is limited to only a few days a year, at which time male Pandas will seek a female to mate with. Adult Pandas will typically spend most of the rest of the year alone. Like many large mammals the female Panda will give birth to only 1 or 2 offspring, which are very small and defenseless at birth (measuring only a few centimeters in length!). In the wild however, where two cubs are born the mother will usually raise only one and abandon the other. In captivity, humans can help to save both offspring by rotating them so that the mother looks after each one in turn. Although efforts have been made to prevent the hunting of Pandas in China, they can still be killed by poachers or in traps intended for other animals. The Giant Panda's distant cousin the Polar Bear also faces grave threats to its survival. Find out more about Polar Bear conservation.